Hi! I have a 15 week old royal standard poodle puppy. He hates going into his kennel, I have to pick him up, 35 pounds and put him in! Hes fine once he is in. Also, when he wakes me up to go out at night, I have had to start putting him on leash, he would play hide and seek with me to not have to come back insidevto his kennel. He is growing by leaps and bounds and i wont be able to carry him much longer! We have just got a 8 week old dalmatian. He isn’t taking to well to his crate. Thank you for these awesome tips looking forward to trying some of them in hopes that Max will let the household sleep for more then 5 hours at night! Wish I had found this website earlier love the rub a toy on siblings idea. Congratulations on your new puppy! I’m glad you’re finding the tips helpful. Most of our puppies took a week or less to get used to the crate. Good luck with your training! That Snuggle Puppy toy sounds great!! Would you take that toy when you go and pick up the puppy to rub on his litter mates and the mom? Or would you suggest taking another toy so the puppy has options when he comes home? 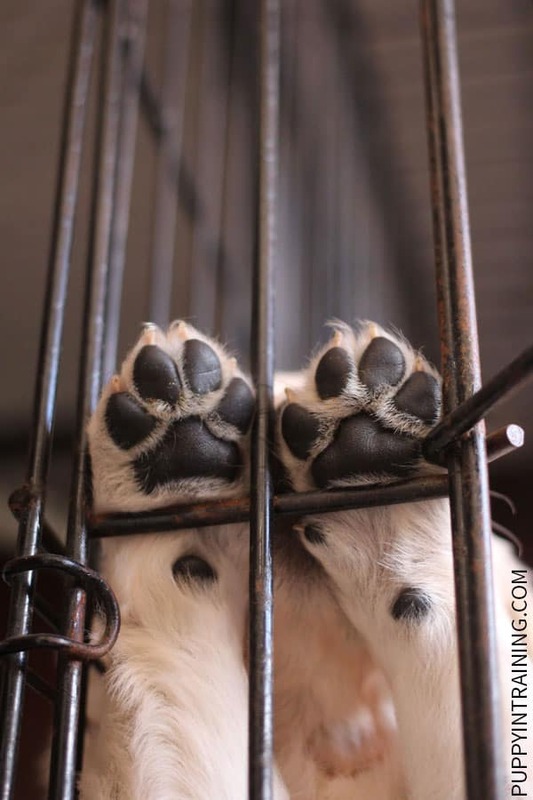 If we have a older dog that we want to crate train…would getting the Snuggle Puppy work for him too? Maybe put our scent on it since we can’t get his litter mates? Two months with no sleep..I can’t even imagine what that’s like. Thanks for the info!! Yes! We love the Snuggle Puppy toy and we would recommend bringing it with you to rub on the litter mates and mom. If you don’t have a snuggle puppy toy then any plush toy or blanket will do. In an ideal situation we would bring our snuggle puppy toy and a puppy blanket to rub all over litter mates and mom. If you have an older dog I’d be more cautious with something like the snuggle puppy toy or any plush toy (although you should be cautious with anything you leave in the crate with your puppy unsupervised) mainly because an older dog may destroy and consume parts of the toy which can be dangerous especially the beating heart and heat pads. I think a better option might be to start with something like a blanket or even your own t-shirt that might have your scent on it to make your dog a little more comfortable when in his crate at night. These tips are really useful. Great stuff. I am a Guide Dog Puppy in training – almost qualified now. I’m glad you found the tips helpful. Good luck with your training! My new puppy wants nothing to do with her crate. I’ve done everything recommended and tried everything. There’s no amount of time where she doesn’t bark and howl anytime she’s in her crate. I’m afraid my neighbors will start complaining. Any suggestions for how to get her to stop this behavior? She also poops each time she’s in there. She also follows me everywhere I go so it may be a bit of separation anxiety and I’ve tried on with her as well. Congratulations on your new puppy! From your message it sounds like your puppy has some separation anxiety. You might look into bringing in a certified professional dog trainer for an in home evaluation to offer you some advice. One thing I didn’t mention in the post that might help is a Thundershirt. The Thundershirt wasn’t a miracle cure with my dogs, but it did help them when they were anxious. I’ve heard some say it worked wonders while others said it did nothing for their dog. It is something worth looking into. I’m not sure if you were able to try all 19 of the suggestions in this post, but hopefully a Thundershirt or one of the other tips will help. Good luck with your puppy! I’ve read a couple of your blogs. I’ve read this one and the one about puppies peeing in the house after you’ve taken them outside. I’m glad I’m not the only one struggling with these puppy things. I’m glad that my puppy isn’t a “bad puppy”. 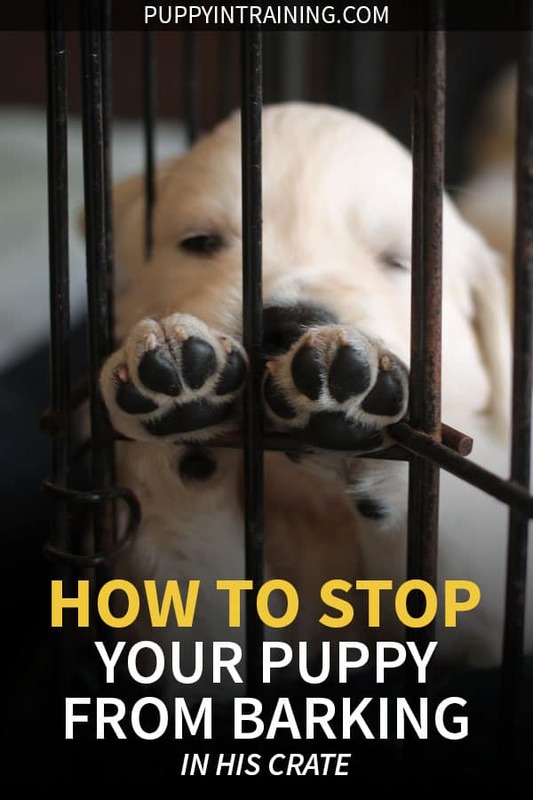 I will say I read through all your tips and I’ve tried many of these prior to reading this, but the one tip that worked for me was laying by my puppies cage and talking softly to him telling him he was a “good boy” and then ignoring him when he would cry. I may be sleeping on my floor tonight, but I know it will be worth it in the long run. I have a Great Pyrenees pup and this breed is already hard to train because they are naturally the dominant. I mean they have to be dominant if it’s in their breed to hunt wolves. Next step is to get him to quit peeing in the house. I just have to stay calm. He just turned nine weeks today! Congratulations on your new puppy! I’m glad you found something that’s working with your puppy. Yes, 9 weeks old is still very young. Keep working at it and remain consistent, persistent, and patient. Good luck with your training! You may want to consider bringing in a certified professional dog trainer for an in home evaluation. When we first bring home our puppies our number one goal is crate training. We basically work on it day and night. Sometimes we get lucky and our puppy adapts to the crate almost immediately (Charlie) other times it has taken over a month of working with the crate day an night (Stetson). One thing we’ve done with our puppies during the day is make sure our puppy is successful every step of the way. Starting with training crate training sessions as short as 5 minutes and slowly working toward getting our pups to stay calmly in their crate for several hours. Hopefully if you can work on getting your puppy to calmly stay in his crate during the day he will have more success at night.